From the beginning, Numark’s Mixtrack Series has given DJs the perfect mix of essential utility and professional capability. Mixtrack Edge brings the same spirit, offering advanced technology in a sharp design built for DJs on the go. 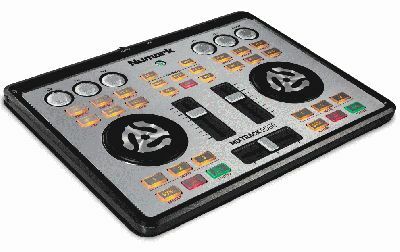 Numark will unveil Mixtrack Edge at Musikmesse 2013 in Hall 5.1 at Booth B45 on April 10th in Frankfurt, Germany. Mixtrack Edge’s slim low-profile design features an integrated cover to protect the control surface and a full array of bright backlit controls surrounded by brushed aluminum, including sync, hot cue, loop, and two effects controls on each channel. An audio interface is built in for headphone cueing and PA system output. Slim metal platters control pitch bend, pitch fade, song selection, and cue mix. Mixtrack Edge is class-compliant with both Mac® and PC and operates via standard MIDI, making it compatible with virtually any DJ software. It’s also USB-powered, so no power adapter is required.